Results from Baccarat Simulations Series 26 are presented below. In this series, I examined B2 setups. Data Set: 100,000 baccarat shoes used from Virtuoid 100,000. This entry was posted on February 8, 2011 at 10:56 pm and is filed under Life with tags analysis, B, B setups, baccarat, baccarat simulations, baccarat simulator, banker, bet, bet progression, data, flat betting, method, money, money management, player, program, programming, results, setup, shoe, strategy, system, testing, trigger. You can follow any responses to this entry through the RSS 2.0 feed. You can leave a response, or trackback from your own site. Just wondering if you could explain what a B 2 set up is? Did you find it interesting or unusual that the 2 results were so different from each other (-1.50 vs.-1.04)? Also, just wanted to say that it’s refreshing to see a web site about Bac that doesn’t have an ulterior motive. I think the differences in expectancies are consistently within the range of theoretical for P and B. 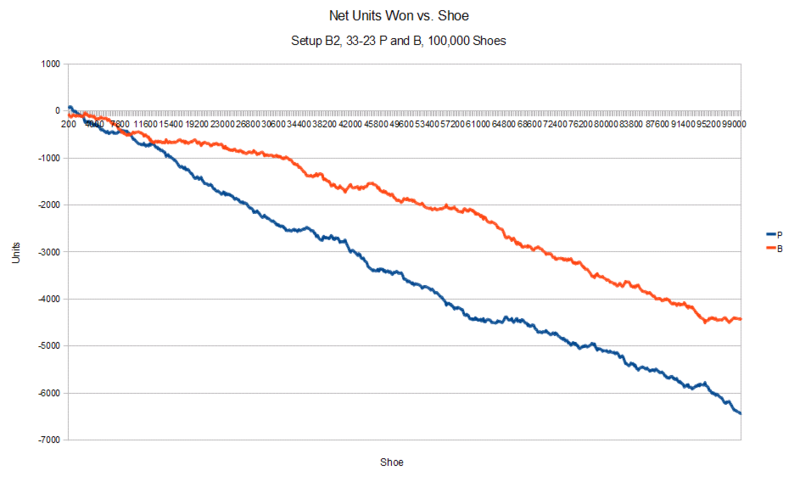 If you notice on the score-vs-shoe graphs, the variance is such the simulation ended on an up-tick for B and a down-tick for P, which pushed them slightly off the down-sloping mean. But the mean itself is basically what’s theoretical for P and B. (Theoretical for P is -1.24% and for B is -1.06%, but in my simulations, I’m finding experimental values closer to -1.36% for P and -1.18% for B.). So, the results of setup B2 appear to be consistent. My friend is the author behind the concept behind setup B2. Let me check with him if I have permission to explain his concept here. Thanks for the encouragement. Yeah, the whole motive behind this site is because when I was first starting out in baccarat, there was a lot of noise and claims about bacc systems, both pro and con, but no objective evidence backing either side – just a lot of bickering at the forums. Long story short: I learned the hard way the truth about bacc systems, and I wanted to provide the kind of objective evidence that was lacking, what I wish I could’ve seen before I fell for the system sellers myself, so that others can benefit from my experience. Sadly, most will still have to learn the hard way for themselves the truth of the matter. Nevertheless, if I was able to help even one person from losing a cent to faulty systems and casinos, it would be worth it. Best of luck to you, too! Your search for the truth is over. Here it is: If anyone ever did develop a winning Bac strategy they wouldn’t be selling it for any amount of money. I believe Theoretical for p is -1.23% & b is -1.06% if ties are counted in the calculations. If ties are counted as non-events & not used in the calculations then theo for p is -1.365% and b is -1.17%. I would guess your computer runs consider ties as non-events, so looks like your experimental values are extremely close to theo. I’m gonna take a wild guess at what the B2 set up was: Wait for 4 players in a row then bet 1u on bank & 1 unit on player. Run the 100K shoes & see what happens.?? Thanks for pointing out that the theoretical expectancies when ties are non-events match my experimental values! Yes, in my simulations of methods which do not bet on ties, ties are completely omitted from the data-set, and so no ties bets are made. I had thought that the discrepancy between my experimental values and what I thought was theoretical was due to the later being based on all possible combinations, whereas the former was obtained over a much smaller subset. But now that you have explained the reason for the “discrepancy,” it all makes perfect sense, and I’m quite pleased that everything is consistent. Thanks! My friend gave me permission to briefly describe the B2 setup. He was exploring different card-counting approaches. Whenever this trigger occurs, bet P for one simulation, or bet B for the other simulation. Oops, sorry about that, I just did some math to double check what I told you and it turns out that the theo for p is -1.36%, not -1.365%. Speaking of counting in Bac,…..
Thorp, Griffin & Vancura all agree that the 4 is the best card for the player & 6 is the best card for the Banker. They also say that the 5 & 7 are (almost) tied for 2nd best card for Bank. Tamburin & Rahm say that the A,2,3,4,”5″ all favor the player with the 4 the strongest and the 6,7,8,9,10 as Bank favorable cards but they list the 6 & 7 as the least favorable of the group. In fact they have the 9 as being 24 times as strong as the 6!! Avery Cardoza says the 2,3,4,5,6 favor the player and the 8—->K favor the Bank with A & 7 as neutral. Who do you think is correct? My guess is Thorp, Griffin & Vancura. It is interesting to note though that there are slight differences in relative strength for the numbers even between Thorp & Griffin. I think these small differences are just due to Griffin going to more decimal places so his #’s are probably most exact. Have you ever explored counting in Bac? Yes, I’ve done a few sims involving card counting, the most extensive being Michael Brannan’s Advanced Tie Count (ref. The Ties That Bind). Some of the previous Setups I had explored recently involves card counting for P/B (not ties). Haven’t found a comprehensive system, though, that offers a playable edge. Let me know if you know one, though! I read Thorp’s treatment about card counting in bacc in his book Mathematics of Gambling. His conclusion, though, is that counting in bacc is about ten times less efficient than counting in BJ. So, if one wants to count, Thorp recommends he should play BJ. You are correct, Dr. Thorp & all other legitimate, credible authors agree that Bac counting is a waste of time. It so rarely gives you an appreciable edge that it isn’t worth pursuing. Of course, they aren’t sitting @ the bac table anyway like I am. Counting is not powerful enough in & of itself to quit your day job, but if you are @ the table anyway then you can use it to slightly decrease the odds against you. Usually 80–90% of my bets are on Banker so if I see from my simple count that it’s getting late in the shoe & the remaining cards are overloaded with 4s & 3s and deficient in 6s & 7s, then it’s a good time to either switch my betting bias over to Player or take a walk til the end of the shoe. My real goal is zero (% that is). I don’t expect (or try) to empty the rack when I walk in the door. My approach is to try to whittle that 1.2% down as close to 0 as I can. I take full advantage of the comps, coupons & match plays they offer & then try to scrounge some more. (~0.2%) A little counting (maybe~0.2%). Occasional dealer errors (I love playing heads up with a tired dealer). Etc. I think the most important “skill” you can develop is staying off of TILT & on your game plan. I have something for you to test if you are interested.